Twelve Webster Vienna students represented five countries at the Model UN in Singapore. Twelve Webster Vienna students traveled to Singapore in February for the Model United Nations Conference at Nanyang Technical University (NTUMUN), considered the most renowned Model UN conference in Asia. Model UN offers students a unique global experience and particularly complements the International Relations program by placing students in the shoes of diplomats, politicians, government officials or journalists to discuss current issues and offer new solutions to political, economical or social problems. 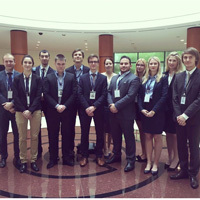 In preparation for the Singapore conference, where the students represented the United Kingdom, Italy, South Africa, Qatar and the Czech Republic, the delegates created research portfolios consisting of an opening statement, background information on the country, talking points on all of the topics to be discussed in the committee and an overview of the position of other countries. The delegation also attended a workshop held at Webster Vienna on how to write a successful position paper. After international conference trips to France and New York and hosting a conference at Webster Vienna last fall, this was their first to an Asian MUN Conference, creating a completely new experience for the students. "I am happy that I got to visit this amazing city in combination with hands-on experience in the NTUMUN conference," said Lisa Dieplinger. "I will definitely never forget this trip that enriched my life in so many aspects." Model UN conferences are busy, schedule-packed affairs, but after the conference completed the students were able to spend two days sight-seeing around Singapore. "Not only did we take part in a well organized and challenging conference, we also experienced Singaporean culture and learned about an interesting and vibrant part of the world," said Ahmed Ahmed, one of the student delegates. Read more about their trip in this Webster Vienna story. See more photos in this Flickr album.